It’s Durga Puja Season, and no better way to start this auspicious journey than with PUCHKA. 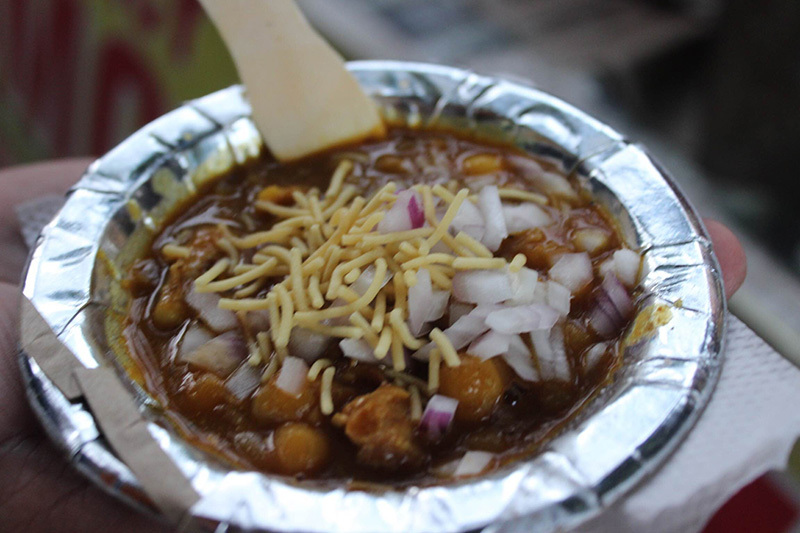 Us Dilliwalas, are obsessed with chaat; the sweet, savoury, spicy and tangy flavours that just burst in your mouth. Puchka, the Bengali cousin of Gol-gappe or Pani Puri, is a must-have whether it is festive season or not. So, we made our way to C. R. Park for the authentic Puchka experience and found ourselves at a little stall called Raju Puchkawala. The 20 year old shop serves some of the tastiest chaat in the area. The Puchkas are made of wheat unlike gol-gappas that are usually made of suji. It is filled with a mixture of mashed potatoes, various spices, coriander and chickpeas, and then you can choose between khatta paani or meetha paani. Even the “paani” for puchkas has a tamarind base contrary to Jal Jeera which has a mint base. 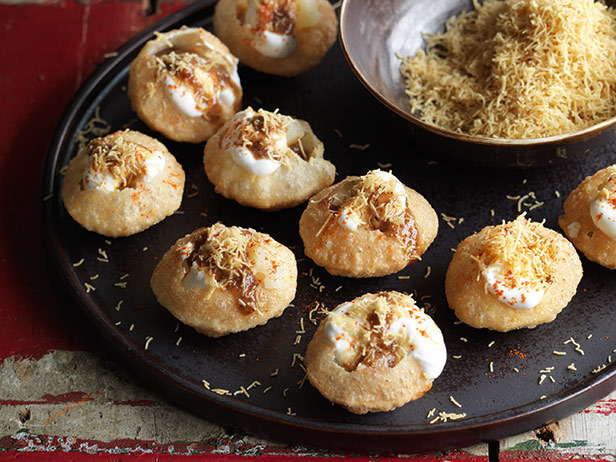 This may sound like any other pani puri to you, but wait till you taste it. The flavour combinations are so on point, that there is no way that you wouldn’t go back for at least one more plate. These Puchkas are like flavour bombs, just one puchka packs quite a punch. Now, if you think Puchka is all this place has to offer, you are highly mistaken. Another crowd favourite is Churmur. As the name suggests, churmur is a mixture of a few tid-bits that are mixed together to make this Amazing dish. They add boiled potatoes, chickpeas, a combination of spices and some puchka water, along with some crushed Papri- All this is mixed together and voila, your churmur is ready. The Aloo Kabli served here is truly unique. Instead of frying the potatoes and drowning them in spices and green chilli chutney like the usual Aloo Chaat, here they use boiled potatoes that are topped with onions, green chillies, spices, chickpeas and tamarind water; this combination has a surprisingly refreshing taste that is quite different to the super spicy Aloo Chaat that we Dilliwalas are used to. Experience bengali culture in the streets of Delhi. And if you can’t make it to C.R. Park for this lovely chaat just mark the dates 20th and 21st October’18 for the NBT Flavors Fest at Baba Kharak Singh Marg, and discover street delicacies from all over India or you can just chow down on these mouth-watering (literally) Puchkas, and call it a day! With Durga Puja kicking off, there is no better time to visit this mini-Kolkata of South Delhi, where you can pay homage to the goddess as well as to Bengali cuisine. And if you think that all you’ll find are sandesh and fish dishes, you are very mistaken. Delhi Food Walks decided to take a little trip down the gallis of Chittaranjan Park (named after the patriot or deshbandhu Chittaranjan Das) to bust this myth and to guide you to the best places for delicious Bengali specialities. Most eateries in Market 1 are located in a single file; you can stop and sample as you walk down the lane and breathe in tantalising whiffs of mustard and fish. Nearest metro station:Nehru Place from the Violet line and then auto ride to Market 2. When to visit: After 6pm, for an evening of merriment! We started off with puchkas (the Bengali iteration of golgappas) sold by Raju who hails from Bihar’s Kishanganj district. For the last 20 years, Raju has been delighting customers with fried wheat puchkas filled with a spicy mixture of jeera, coriander, black pepper, green chillies, potatoes and black chana (most golgappas in Delhi are filled with saunth and made of suji rather than wheat). He also sells a Bengali variant of the ubiquitous aloo chaat – aloo kabli is made of boiled potatoes, tamarind water, chickpeas, green chillies, onions, masala, and salt. 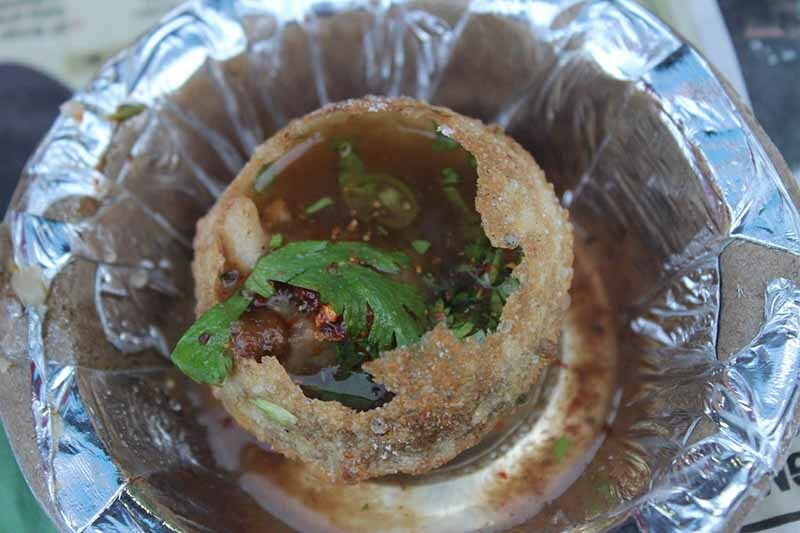 Chaat lovers should also try the churmur, which is rather like a hybrid of puchkas and aloo kabli. It’s a tangy, crunchy and sweet concoction featuring chickpeas, tamarind water, boiled potatoes, crushed puchkas, green chillies, cilantro and black chana. At Shyamal Barua’s stall, the signboard advertises both momos and ghughnee, but it’s the latter that you’re really here for. Mr Barua proudly exclaims that his mother is the master chef behind the finger-licking ghughnee which he has been serving since 2003. An extremely popular snack in Bengal and in parts of Bihar and Orissa, ghughnee is a curry made of chickpeas (motor in Bengali) that are soaked in water overnight. There’s a veg version as well as one with minced mutton. We can forgive the owners for misspelling “kati rolls” as “kathi rolls”, a mistake made by most people outside of Kolkata where the dish originated at Nizam Restaurant; the word kati means skewers in Bengali and was applied to kebabs and then to kebabs wrapped in paranthas. You’ll find a wide range of mutton, chicken and paneer rolls here, but it also serves up prawn cutlets, veg chops, Mughlai paranthas, barbecued meats, shawarma and even a small selection of Chinese dishes among a host of other preparations. Don’t get too distracted, though – the rolls are what stand out, livened up by different sauces, including the mustard-and-raw-mango kashundi, a secret masala and chopped onions. Perfect. This place is right next to Kolkata Hot Kathi Roll and provides head to head competition to its neighbour, serving many of the same dishes. Their menu claims “Delicious Start Right Here” and they aren’t far off the mark. They are famous for their Chinese specialities (let’s not forget that Kolkata is considered to be the birthplace of Indian-Chinese cuisine) as well as their chops and kobirajicutlets. We highly recommend the Chinese chat which comes with a variety of toppings and a choice of either noodles or rice. For just Rs 200, a non-veg platter will allow you to sample Schezwan chicken (our fave), lemon chicken, chilly chicken, garlic chicken, chicken wings, chicken Manchurian and sweet ‘n’ sour chicken. The veg platter, on the other hand, costs Rs 120 and includes veg Manchurian, chilli paneer, crispy chilli potato, crispy honey potato, and mix veg salt ‘n’ pepper. You’ll be spoiled for choice with the myriad types of momos served here — chicken, veg, paneer, soya, steamed, fried or tandoori. The beautiful little stall is made from bamboo sticks and also uses a traditional bamboo basket for steaming the momos – not a common sight in Delhi. It also differs from most other purveyors of momos in the city in that the dumplings are made of whole-wheat rather than white flour. Besides, have you ever seen momos shaped like a fish or a samosa? The fresh, hot momos are served with mayonnaise and a drool-worthy sauce made from butter, sugar, red chillies, tomatoes and onions. There are three other branches of Mad About Momos in Amar Colony, Central Market and Pocket 8 Vasant Kunj. The shop traces its origin to 1971, the time when Chittaranjan Park was just a piece of land allotted to displaced people from East Pakistan. For lunch, they serve rice served with either egg (Rs 40) or fish (Rs 60). Their aloo chop (pronounced alloor chop in Bangla), bread pakoras, beguni , chop pakora, mirchi pakora and onion pakora make for perfect evening telebhajas (fried snacks), best enjoyed with a cup of hot tea. Prabir Kumar Mukherji, the proud owner of Kamla Sweets, has been successfully operating for past 30 years. Here you can sample the quintessential misti doi (sweetened curd), available in traditional mud pots of different sizes (100gm to 1kg), as well as Bengal’s most famous dessert, sandesh (the “a” is pronounced as “o”) in different shapes, sizes and colours. Their conch- and fish-shaped sandesh are masterpieces and the steamed version (bhapa sandesh) guarantees love at first bite to the sweet-toothed. Other specialities on the menu include chum chum, dudh pulisita bhog, chandrapuli, rosogolla, bundi laddoo and lobongo lotika. You can also try chhena poda (Rs 500 for a kg), a caramelised cheese sweet that actually originated in Orissa. I you visit around breakfast you can also try savouries like khasta kachori, matar kachori and radhaballabhi (urad daal stuffed in a puri); they also make beetroot chops, a rare delicacy in this part of the country. Don’t be deceived by the name. This game-changer of a stall not only serves tea or “cha” but also cold coffee with ice-cream and dry fruits, hot coffee (pick from Nescafe, Bru and Davidoff), hot chocolate Bournvita and a variety of teas — lemon, tulsi (green), Arabian, jasmine, among others. The best part about this ‘cha’ stall is that you can have your tea customised to your taste. His lemon cha was the highlight for us – it contains a flavourful medley of amla, black salt, black pepper, jeera syrup and Hajmola that will cause an explosion of flavours in your mouth. His fame speaks for itself as crowds throng his stall. With a genial smile on his face he tells us that he been known as the jhaal muri wala of CR park for the past 12 years. Hailing from Krishnanagar in Kolkata, Vikas started off as a shopkeeper at Annapurna Sweets, but now specialises in all things tangy and spicy. He reels off his specialities in a breathless monotone: ghugni, ankur chaat, aloo kabli, bhel puriand, of course, jhaal muri which he sells for Rs 20 only. Do try his mouthwatering mutton ghugni – a hot chickpea curry with minced mutton served with a garnish of onion, tomato and cucumber. A former accountant at Shaw Wallace, Mr Benoy Majumdar, has been running this place since 1984. Their star dishes include chhena jalebi(a jalebi made of cottage cheese instead of flour and with a taste quite similar to a gulab jamun; Rs 140/kg); the enticing jal bhara sandesh(a sandesh with a liquid centre); kheer puli (a doughy sweet dish made predominantly of kheer that melts in your mouth like a soufflé; Rs160/kg). They also serve every Bengali’s favourite breakfast dish – radhaballabhi, a puri stuffed with dal and veggies. Want further proof of their popularity? They often stay open well past the closing time of 10pm because the orders just don’t stop coming. Opened by Narender Mistri, affectionately called Dadu, in 1992, the shop is now managed by his son Shyam Mistri. Their fried bhetki fish is fried to crisp perfection (the audible crunch as bite in is evidence) and their famous egg devil chop is sin on a plate: hardboiled egg filled with cooked egg yolk and potato all wrapped up in crispy bread crumbs. The Mughlai paranthas are yummy too, and their samosas (calledsingharas) contain a unique filling dominated by coconut and chickpeas. Located in the back alley of the market, this small restaurant specialises in authentic Bengali cuisine. Subhrojit, the son of the owners — Manju and SR Dutta, who are originally from Kolkata — proudly narrates the story of how his parents set up the restaurant about 19 years ago. The Maa Tara Special Thali consists of an assortment of dishes, out of which the mutton kasha shines out. Paired with luchi (puffy flour bread), the tender meat with just the right balance of spices will leave you asking for more. The mustard fish curry stands out too. Fish lovers can choose from pomfret, ilish, chitol, rehu and more — all for under Rs 400. Vegetarians must try the postor bada – a pakora with poppy seeds.